Bad manners are on the rise. People raised with good manners are failing to utilize the conduct and behaviors taught to them as children. In generations following mine, their importance seems to be declining. Respect looks like a one-way street. My mom was the high priestess of good manners. She quietly instilled the basics, reminding us when we fell short. We understood the importance of sharing, excuse me, please and thank you, and not spitting in your brother’s food. Hitting, swearing and outright meanness were punishable offenses. I plan to write a blog about swearing that exonerates me. Today anything goes when done in the name of morality or in defense or free speech. People regularly engage in name-calling and hurling insults. Egregious personal attacks and mudslinging abound in the political arena, on social media, and television. Even texting and email are in the fray. Everyone is guilty of bad manners all the time. Of course, this does not include you and me. On one end of the spectrum, we have a growing lack of basic manners, common sense and courtesy and thoughtfulness. These represent small offenses like failure to use “please” and “thank you,” or apologizing for an unintentional oversight. On the other end of the spectrum live big offenses like hate speech, insults, stereotypes and violence. Here, meanness is the new normal, emboldened by anonymity. Raising well-mannered children includes behavior rules and the consequences of not following them. The people raising them own this responsibility. Children begin life self-centered and learn by examples set for them. With positive reinforcement, they grow into adults mindful of others’ feelings and the enormous power of words. 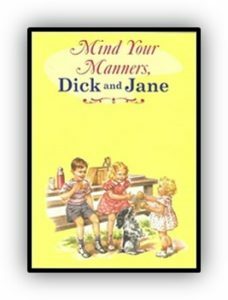 Good manners instilled in young adults prepare them for the professional world, but just in case, an employee handbook on acceptable behavior is part of the onboarding process.There are no excuses. Behavioral norms exist. No matter who or where we are, a daily dose of good manners does no harm. Rejecting good manners on a small scale hurts feelings; on a global scale, practiced without regard to consequences, it divides nations and weakens democracy. Good manners are good business. Christine Pearson, Professor of Global Leadership at Thunderbird School of Global Management, conducted a decade of research on civility in the work place. Civility is a fancy name for good manners, and Dr. Pearson’s bottom line says employees leave jobs because of continuing incivility, though most never admit it. What?? Yes, indeed—and sixty percent of that disrespect comes from the top down. Peers and lower-level employees share the remaining forty percent. Workers experiencing ongoing rudeness decrease their performance and eventually look for a new employer. Good ones are out there. Everyone knows the toxic employees. Everyone. They are often high-performing individuals, protected by that very same sixty percent. Gary Vaynerchuk has some great advice for getting rid of them. People feel empowered to speak hate and encourage violence knowing they are anonymous and invisible. Lashing out incognito through social media, especially in a volatile discussion, ratchets up the level of disrespect until the conversation is beyond repair. It is so pervasive we develop immunity to it, often responding in kind. When you are unaware of your behavior or, worse, proud of it, you become the problem. 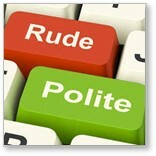 Sensitivity to others, especially in social media posts, falls into another black hole called entitled rudeness. People ignore the rules of common courtesy, interrupting and proselyting, shaming others and elevating themselves above the rules of polite conversation because they feel entitled to do so. Read a variety of reliable news sources with different perspectives to understand more about what divides and unites us. Listen respectfully to people with views that don’t match yours, resisting the urge to stereotype or use insulting or derogatory language. Bring people with differing viewpoints together locally for productive conversations. I don’t know about you, but I don’t think it’s working. Free speech is our right—it protects the trend of toxic speech in cloud conversations around the world. This is a subjective topic, requiring empathy and sensitivity. It is one best governed by self-awareness and kindness. The First Amendment of the Constitution guarantees each of us the right to free speech, including certain offensive words and phrases to convey political messages. Yes, it does—it’s right there in the fine print. However, just because we can doesn’t mean we should. It is not acceptable to confuse truth for rudeness and rudeness for truth in an effort to justify what we say and how we say it. Once upon a time, good manners were important. It’s time to make them important again. Manners shape the world we live in. Without them, the world shapes us in response to what goes on around us. It is our job as parents, clergy, educators, role models, influencers and professional communities to keep setting examples. There is no other way.